Eddie Farley – Hall of Honor 2004: Eddie Farley was the first African American football player at Austin College. (He may have been the first African American athlete at Austin College) By being the first, Eddie demonstrated incredible courage and leadership. 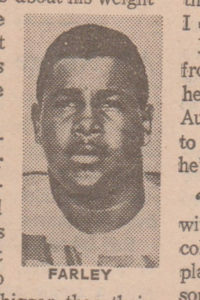 Not only was Eddie the first African American to play football at Austin College, but as a freshman in 1968, Eddie made a significant contribution to an 8 – 1 football team that finished the year ranked 6th in the nation. Eddie was selected by his teammates in 1968 to receive the William B. Traylor award given annually to the hardest working football player. Eddie played four years of football at Austin College but a broken bone in his neck prevented him from achieving greater honors. Eddie graduated from Austin College and went on to a very successful career at Texaco where he was the director of human resources for Texaco Refining and Marketing reporting to the president of Texaco Refining and Marketing. Eddie’s career was cut short when he suffered a stroke a few years ago. Eddie has contributed to Austin College financially and by the example he has set in his community and his life.